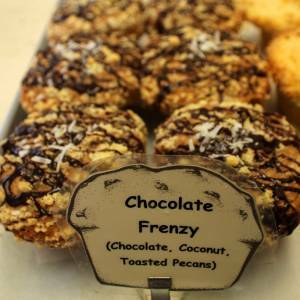 Chocolate Frenzy… is there any other kind! It’s not enough to satisfy your taste-buds, when you’er in a frenzy you need some crunch. This muffin’s got coconut shavings and toasted pecans to satisfy your tastes and your teeth. It practically screams eat me. Or at least it would if it hadn’t been baked at 300 degrees Fahrenheit! You won’t be able to talk either with a mouthful of this muffin. Disclaimer: Feeding frenzy, love frenzy, shark attack, and earthquakes probable.